10-11 February 2014- 10a.m.- 4.p.m. The Dortmund Study Days is a yearly event, following the line of seminars on Buddhist philosophy through Sutra texts given by Dr. Nadine ReiMyo Tierelinckx at the University of Dortmund, from 2001 to 2012. Her seminars were intended for students of all university departments having a philosophy course in one’s curriculum and thus wanting to be introduced in the Indian philosophical methods of investigation upon which the Buddhist Thought rests. Initiated in 2013 these Dortmund Study days rejoice the actual trend in the Buddhist development on the European ground. The elements of it can be listed as follows: The study of Buddhist historical development, the translation of its canonical texts adapted to the European modern language and the translator’s large commentaries replacing it in its context as well as the critical approach to the Buddhist texts done by Buddhist scholars’ practitioners or Non-Buddhist researchers. All this can be considered as the features of the European Buddhism in its adaptation to the European mentality marked historically by the imprint of Christianity. Being a Buddhist practitioner of the Japanese Rinzai Zen tradition as well, Dr. Nadine ReiMyo Tierelinckx also comments the sutra in the context of a daily practice. With the Sutra Entry in Lanka, the central theme of these study days is directed towards the cessation of ignorance. Last year we studied the chapters concerning the nature of the skandas, the eight consciousnesses of the yogacara philosophical theory and the Ravana’s experience of Awakening. This year we start the Entry of Lanka from Ravana’s two questions asked to the Buddha, after his Awakening: they lift up the veil of ignorance, i.e. the nature of the fictions created by the Mind and the study of the theory on the three natures of the Mind, taken from Vasubandhu`s Treatise on them (sk. Tri svabhava nirdesa) and reinterpreted in this sutra. The German version of the above Sutra will be distributed at the beginning of the seminar. She is the 84th Heir in the Sakyamuni Lineage of the Rinzai Zen Tradition of Hokoji (Japan) and Dharma Heir of Oi Saidan Roshi, Chief Abbot of Hokoji monastery, Hammamatsu, Japan. Zen Hermitage Myoho-An in Dortmund, Germany, is framed into the Japanese Zen Tradition, that is to say a Zen monk's living, led in solitude and retreat. In ReiMyo's case, her hermitage way of living is as well inspired by Ryokan's (1758-1831) as also adapted to the actual European conditions. 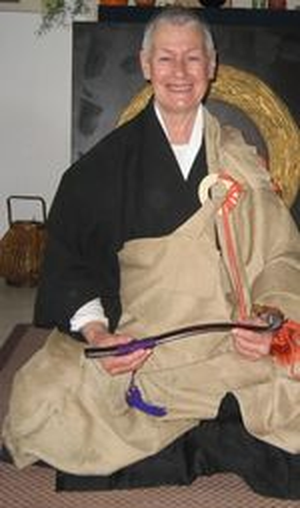 84e héritière du lignage de Shakyamuni Buddha de la tradition Rinzai Zen du Temple d’Hokoji (Hammamatsu/Japon) et héritière du Dharma de Roshi Oi Saidan, Abbé Supérieur du monastère de Hokoji. Myoho-An, son ermitage Zen à Dortmund en Allemagne se place dans la tradition japonaise de l’ermitage Zen exhortant le moine Zen à vivre en solitude et retraite. Dans le cas de ReiMyo, son mode de vie zen est inspiré de Ryokan (1758-1831) ainsi qu’adapté aux conditions de vie européennes.